Fellow eurocrat (and fellow nerd) Michele Ferrari has been an advocate of technology for years: as far as I know, he was the one who come up with the "simultaneous consecutive" mode and the first one to use it on the job (during a Neil Kinnock press conference in Italy). A few months ago he wrote up his experience with another interesting piece of technology: bone-conducting headphones, which he had heard about from Martin Esposito. I was intrigued enough to try it out myself. And since Michele's review is tucked away on our intranet, here's my take. Bone conduction is a fascinating concept that has been around for quite a while. Instead of sending sound waves into the ear canal to be picked up by the inner ear, the sound is transmitted directly to the skull bone through contact with the transducers in the headphones. If you've ever listened to a recording of your voice and wondered why it sounds different from what you're used to - well, it's because of bone conduction. Consequently, bone-conduction headphones are not worn ON the ears, but IN FRONT OF them. This technology has two advantages: you protect your sensitive inner ear (and avoid hearing difficulties or even hearing loss) and you hear yourself better (leading to better self-monitoring). The Aftershokz are delivered in a nice, sturdy carrying case, which is a big plus for travelling interpreters. It takes some time to get used to wearing the headphones - the experience is unusual, but comfortable. The neckband may occasionally rub against your shirt collar, but that isn't really a problem. However, I do wonder if glasses reduce the bone-conduction effect, since the frames are stuck between the transducers and the side of my head. 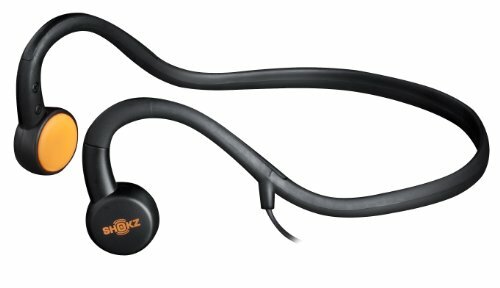 I haven't tried the Aftershokz for listening to music, but they work well enough for voice (or podcasts). The sound is somewhat tinny, but similar to my preferred treble-bass-configuration for traditional headphones. The trick to using bone-conduction headphones for interpreting is turning down the volume! Most interpreters I work with turn the volume on the headphones very high, often too high for comfort. They speak to loudly, even though they don't really need to, since the microphone is right in front of them. The Aftershokz force you to speak more softly, which should help keep your vocal chords in shape, even on long days. Reducing the volume also balances out another potential problem you might face with bone-conduction headphones: sound leakage. Most of my boothmates told me they could hear the sound coming from my Aftershokz. The issue here, however, is not with your boothmates, but with the console microphone. If you crank the sound up too high, your delegates will hear the original through your microphone - and that should be avoided at all costs. One thing is certain: adding bone-conduction headphones to your toolkit takes time. Be prepared to give it a few booth days to adjust. Bone-conduction headphones feel weird at first, but the experience quickly improves. My conclusion: The jury's still out. I think I'll test these headphones out for a little longer before I decide whether or not to stick with them. Have you tried bone conduction? Let me know in the comments!